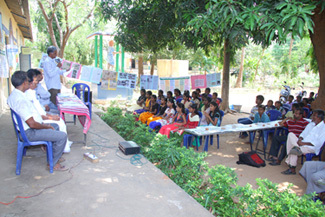 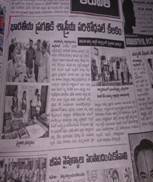 Gnanambica Degree college at Madanapalle on importance Watershed Development. 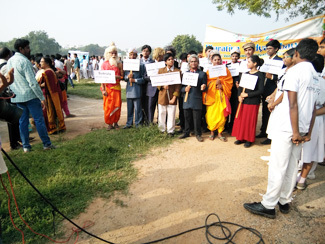 Director Sri G.G.K.Murthy are seen near Certificate of Acknowledgement of RCE-Tirupati. 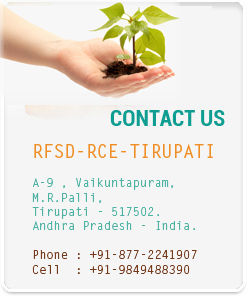 of RCE-Tirupati Dr.R.Ramamurthi and his wife Annapurna. 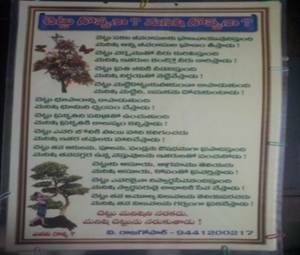 4.Half a day seminar on 28th October 2015 in S.V.University , Tirupati in which papers and posters relating to medicinal plants, Slums of Tirupati, Remediation of metal contaminated soils, Urban greening, Avoid polymers campaign were presented. 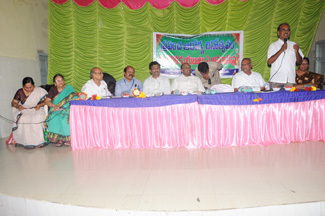 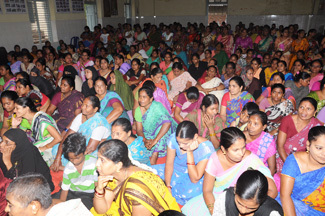 Group comprises R.Ramamurthi, K.P.Rao .M.Bhupathi Naidu,R.Annapurna, Guruprasad,C.V.Naidu,G.G.K.Murthy,Mrs Nirmala. 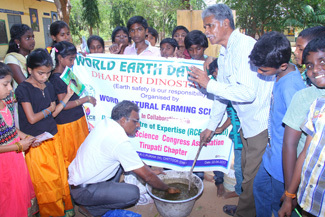 Partners of EcoChallege group of RCE-Tirupati lead by Prof.Bhupathi Naidu cleaning the streets in their neighbourhood. 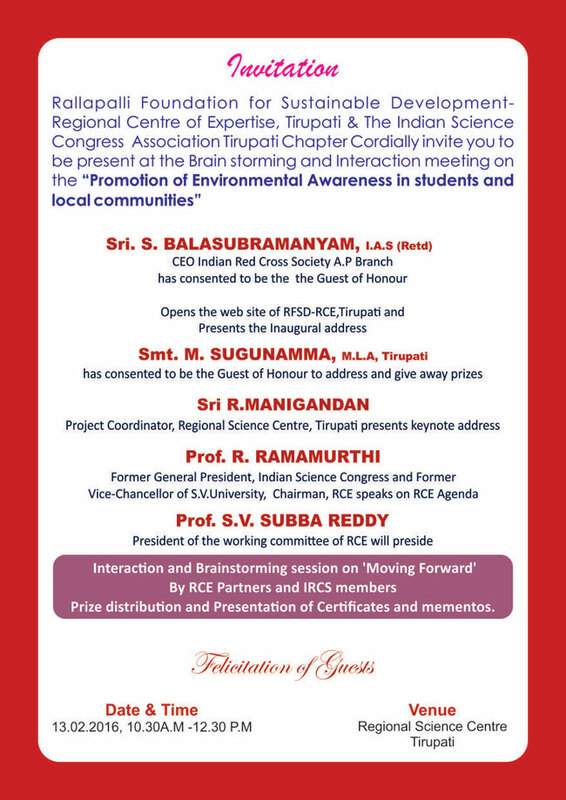 Chairman-RCE a special pre session otf the Indian Science Congress 103 Session at Mysore. 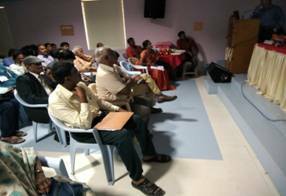 on "Biodiversity Conservation:Current status and road map for the future"
Chairing the session Prof.R.Ramamurthi delivered a talk on 'Education for sustainable development'. 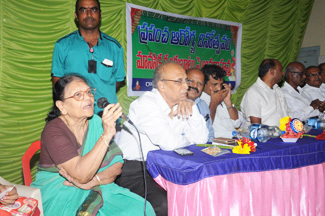 Dr.M.S.Nagar spoke on impact of mining activity on biodiversity.Dr.S.Subramanian spoke on Agrobiodiversity. 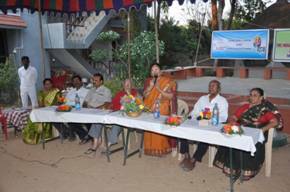 Dr.Giridhar Kinhal spoke on Biodiversity and Forest communities.Dr.Rana spoke on regulatory aspects of biodiversity conservation. 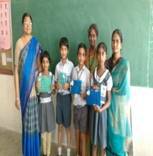 RCE-Tirupati conducted competitions for school children in essay writing and drawing on the theme"Climate change and Global warming;Impact on Environment and Bioresources". 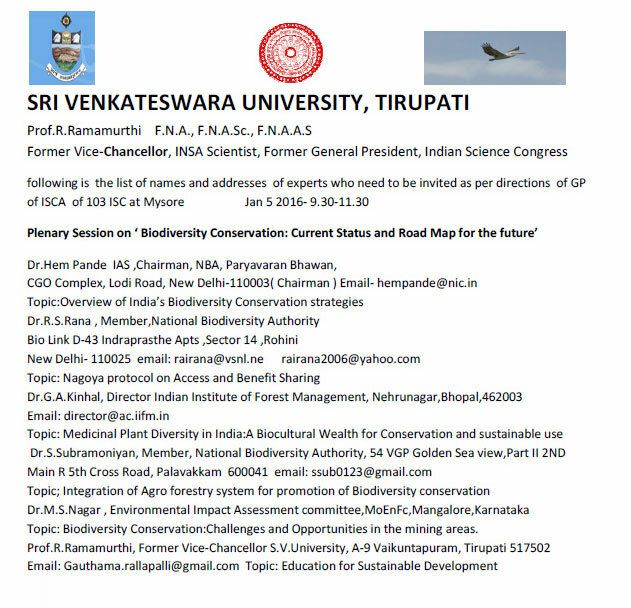 An Interaction and Brainstorming session is scheduled on 13th February 2016 at Regional Science Centre,Tirupati to exchange ideas for moving forward on 'Promoting Environmental Awareness in students and local communities'.The copy of the invitation and the programme are follow. 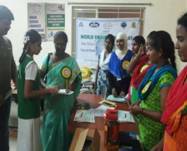 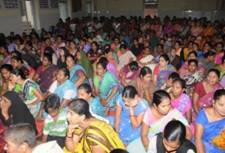 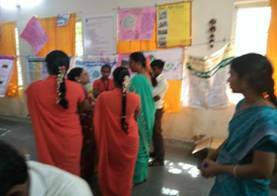 Pictures of world health day -2017-Sensitizing women on aspects of health and awareness. 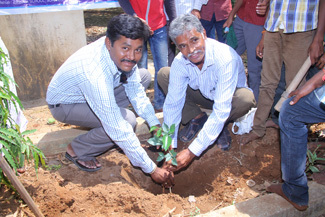 April 22nd 2016 World Earth day: World Earth day was celebrated at Durgasamudram village. 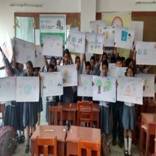 World Forest Day- Sri Pawan Kumar Rao, DFO delivered a special ppt lecture highlighting the importance of development and also protection of forest and wild life. 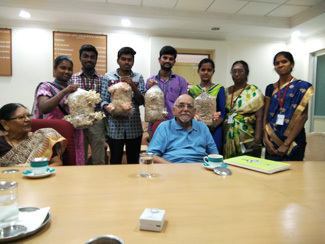 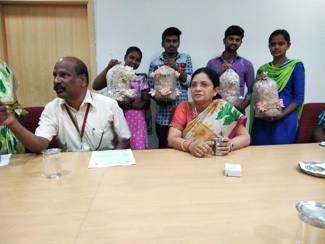 Dr. K. Ramasamy Dean, Agricultural Engineering and Water center Tamilnadu agricultural university, Coimbatore delivered a lecture on conservation of water in agricultural operations. 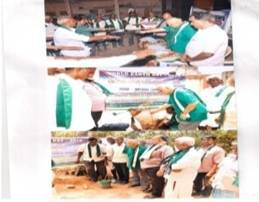 In an open space of apartment complex. Dr. V. Rajagopal an active member of RCE Tirupati and a crusader of saving of environment prepared the chart Man Vs Tree which was released on environment day. 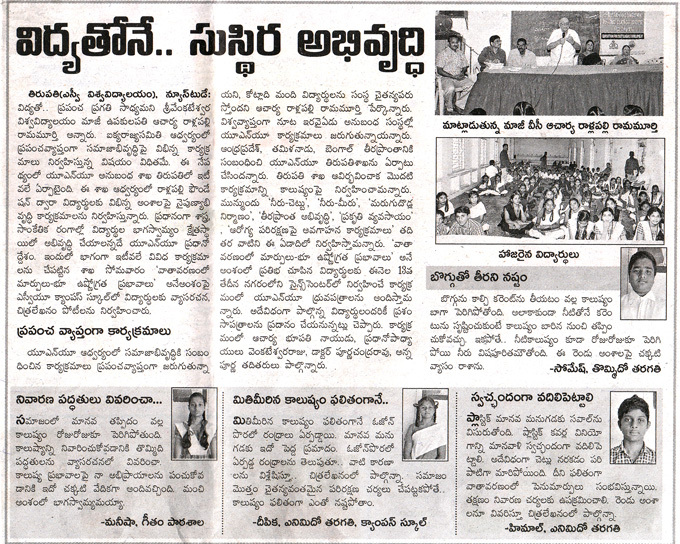 In Emeralds Advanced institute of Management studies, Tiruapti.